Service Jam is about designing and developing services. The goal is to develop a service in 48 hours. The time frame is surely a limitation, but the biggest challenge is to work as a team and to keep the ball rolling. Basically, the challenge is to keep rolling that ball together to the same direction. This year’s theme was: grow^. Teams were formed with “blind date” type of conversations. 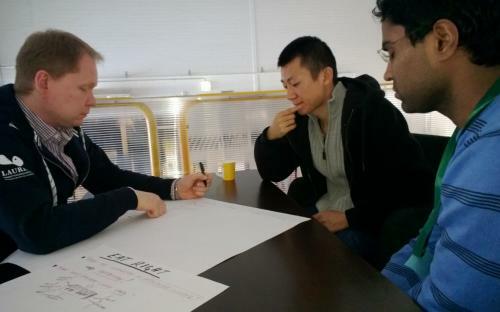 Participants were asked to think about the service ideas or problems about the theme, grow. After a short period we were asked to start sharing these ideas in one-to-one short discussions. The point was that if you can find people with same type of ideas, you should be in the same team. It was obvious that the theme was challenging, too broad maybe. What does it stand for and should the service be precisely about “growing”. We did just the opposite! After changing a group I ended up working with the concept about nutrition. The basic idea was that this nutrition service concept would help people to loose or gain weight or just to stay fit. Basically this would mean that most of the service users don’t want to grow. They want to get smaller. Our team had five guys; Groundbreaking. We heard that this was a first time when “nutrition team” didn’t have any females, so we were not surprised when the adviser told us several times that we should come up with the idea that doesn’t follow the basic stereotypical nutrition program; vegetables, salads, low fat options etc. Sounds like fun! This wasn’t however our team’s common idea of the interesting nutrition service. I liked it! 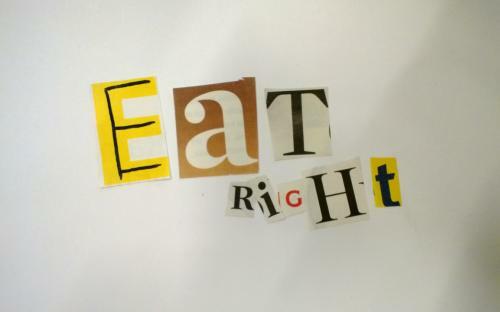 After the 48 hours jamming, we did create Eat Right! Subscription based personalized nutrition service with online shopping experience. The real work started in the Saturday morning. We already had some basics covered, based mainly on assumptions and brainstorming of the service concept idea. The work started by putting everything up to the Service Jam website and setting the right name for the team and concept. Everybody wrote down two names for voting. After some modifications the name was chosen in less than 10 minutes. It was a perfect team work. Eat Right! –service design was ready to start. We decided that we will start with personas to get better understanding about the target group(s). When we had an idea of our target group we went out in the street to interview people. Would they like to use mobile/online –based nutrition guide and how they feel about the online shopping service. Results were obvious; people are well aware of their nutrition (at least they think they know) and they don’t want to pay much extra for grocery shopping delivery to their homes. It was slightly different feedback that we had in mind, so we had to go back in the design process and rethink the concept. Our team continued discussing endlessly about the differe ntiation of the concept and how the goods delivery should be handled. We made stakeholder map and customer journey map to get better understanding of the value chain and service experience. This didn’t really help us. We realized that we have “wasted” much time to debating and discussing about the details, when we had disagreements with the basic concept. Some wanted to build fancy mobile app and some basic nutrition app. Some wanted to develop overall concept with user experience. Time was running out and the team was arguing about the basics. Volume was rising and disagreements went deeper. Before the team can work effectively they must have a consensus of the basic service idea and concept. I also learned that if the team members don’t know each other it is good to have one member acting as a team leader. This would avoid time consuming conversations of non relevant issues and would help to concentrate to core concept and customer experience. Eat Right! team decided to continue as one, and we came back to the basics. We found out that we are learning from each other and there is no point of splitting the team. We agreed that we will demonstrate the service flow and will not concentrate too much on designing the mobile app. This way we were able to dig into customer flow and experience. The application could be designed later on accordingly. On Sunday we shot a film of the customer journey. The team was back on track. We made the video in 2,5 hours. Including the planning, shooting, cutting, music and everything involved. This showed that when the team is motivated and committed it can work very effectively together in short time. Most importantly, we had great time. Everybody was enjoying and we literary laughed through the film making. We had a clear plan and vision on how to make it. We were also happy with the result and we made it in the given time frame. The team was united again. That happened by succeeding the goal, and we succeeded that together.